Frorkmar Banner-Torn is a Nord soldier and commander of the Stormcloaks who can be found in Dawnstar. He is usually in The White Hall or upstairs sleeping in the barracks. If the Pale is taken by the Imperials, he will relocate to the Pale Stormcloak Camp. 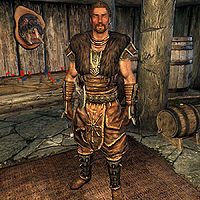 He wears a full set of Stormcloak officer armor, including matching pairs of bracers and boots, and the trademark helmet. He is equipped with a leveled one-handed weapon and a leveled shield, and also has a two-handed weapon. He also carries a hunting bow supplemented with 12 steel arrows, and a steel dagger. This page was last modified on 3 September 2018, at 23:22.